Spring cleaning is on everyone’s to-do list. It’s a chance to put away those cozy throws and breathe life back into your home. But spring cleaning is more than just putting away your winter coats and your space heater. To successfully organize your home for a new season, it’s good to develop some simple systems to maintain the flow of your cleaning routine. Closets are your best friend and one of the best spaces for organizational use. They’re a great place for things you use frequently but don’t necessarily want to display all the time. And for pet-owners and families with small children, closets are a great safety measure. But a closet only stays organized if you have a system for storage. You know those mornings when you are pressed for time and are frantically searching for that structured blazer? Without some sort of organization, it’s a free-for-all at crunch time. But by organizing business suits and pieces to the right and casual wear to the left, you can find what you need in a snap. Organizational systems don’t have to be cookie-cutter, standard processes. With the detailed help of a professional organizer, your closets can be turned into welcoming spaces, free of stressful clutter and tailored to your specific needs and personality. 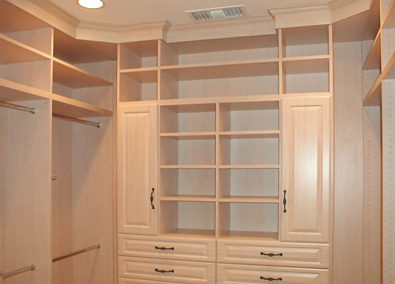 Closets by McKenry develops custom-made systems that work best for your lifestyle. Call us today at (865) 249-6382 to schedule your consultation.